Google Wifi is an accessible wireless router that anyone can get into. Whether you’re in a small apartment and need something that won’t go down or if you’re in a large home in need of range—this is the perfect router for you. The way we look at it, the best wireless routers marry convenience, value, and performance in one pretty little package. Google’s mesh router takes all of these tenets and runs with them, resulting in the Google Wifi, a wireless mesh router that not only performs with the best of them but is affordable and stylish enough to carve out a place in anyone’s home. Paired with the approachable Google Wifi app, you can easily set it up and forget about it, instead focusing on all you want to do online. We spent a long time using Google Wifi in our apartment evaluating its design, ease of setup, connectivity, and software. One of the first things that jump out when you pull the Google Wifi out of the box for the first time is its elegance. In the past, you’d be stuck with these ugly wireless routers with antennas sticking out in four different directions. They were unsightly beasts which encouraged people to hide them behind decor, weakening the signal. The Google Wifi, with its simple white design and a singular color-coded light band, is incredibly unobtrusive by contrast. In fact, it’s one of the rare wireless routers you may want to display prominently, which will make setting the Google Wifi in the perfect spot a breeze. The Google Wifi might just be one of the best wireless routers on the market, and it’s hard to think of someone we wouldn’t recommend it to. We’ve set up dozens of wireless networks in our time, and it is impossible to overstate how awesome the Google Wifi’s setup process is. Understanding that most people don’t want to dig through arcane instructions in order to browse the web, Google makes setup a breeze. You can use any of the three Wifi nodes as the core unit that connects to your modem, so you don’t have to figure out which one is the most special. Then, you just need to download the Google Wifi app on either the Google Play Store or the App Store on iOS. After that, it’s just a matter of scanning the QR code located on each unit, placing, and labeling them. That’s it, it’s that easy. Even with our 250Mbps Xfinity service, setup was a breeze, right out of the box. And, once you have all of the Wifi points connected you can manage your Wifi network through the Google Wifi app. One thing that typically holds people back from really taking control over their networks is software. Having to dig through ipconfig to find your network gateway, typing that into your web browser, then having to deal with the complicated backend isn’t our idea of a good time. But, that’s why the Google Wifi app is so noteworthy. All network admin tasks can be performed through the app, and it’s all laid out in an extraordinarily simple way. A couple of simple taps allow you to set up a guest Wi-Fi network, manage family controls or see if any of your nodes are down. The Google Wifi app even has a built-in network check that will not just test the speed of your network, it’ll check all of your mesh units. This can help you diagnose problem areas in your mesh network. If one of your Google Wifi nodes is getting less than ideal signal, you can just move that node to a more signal-friendly area in your home. There are a couple more advanced functions that the Google Wifi generally handles automatically, so less advanced users don’t need to worry about being alienated by little white cylinders—even if more experienced network admins might be left wanting for finer controls. Take a look at other product reviews and shop for the best mesh wifi network systems available. 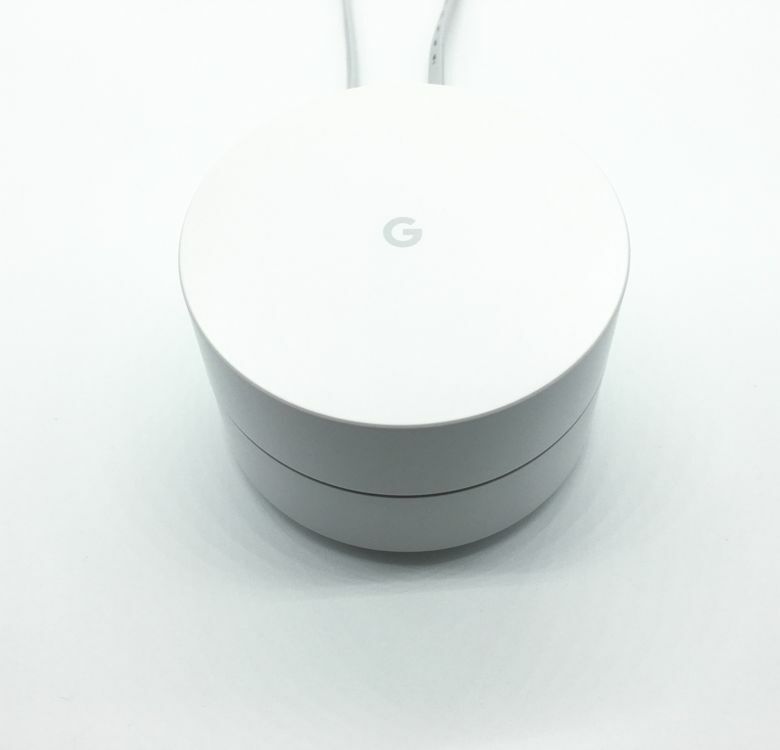 This lack of fine-tuned controls carries over to the Google Wifi’s general connectivity: it’s a bit sparse, at least as far as ports are concerned. Each node has two Gigabit Ethernet ports and a USB-C port, used for power. This does mean that you can have LAN connections in several parts of your home, but if you need several LAN ports in one room, you’ll be left wanting. Fortunately, you can absolutely get by with just the wireless capabilities. This is a tri-band router, with each of the nodes communicating on their own bandwidth, so your gaming won’t get interrupted by someone else streaming or browsing. When it comes to specs, the AC1200 Wave 2 capabilities are impressive enough, but when you add the quad-core ARM processor that intelligently directs the signal to devices that need it the most, you have the recipe for fantastic performance throughout your home or office. For instance, if you have several Google Wifi points set up throughout your home, you can walk around your house watching a YouTube video on your iPad, and Google Wifi will automatically shift to provide a wireless signal from whichever node is closest. You’ll never be interrupted and you don’t need to do anything manually, everything happens automatically behind the scenes. We’ve been using the Google Wifi for about six months at the time of this writing, and we’re not exaggerating when we say we haven’t run into a single problem with dropped connections or slowdown in our time using this router. There were a couple of times a single node went down, but thanks to the color-coded LEDs, we were able to tell right away. And, that’s basically the crux of what the Google Wifi provides: unrivaled reliability. It’s not just reliable, though, it’s also fast. Google advertises a 4,500-foot range for the 3-pack we tested. In confines of our home, we were consistently getting more than 250Mbps wherever we went. In fact, in order to experience slower speeds, we had to walk outside to the middle of the cul de sac we live on, and even then we were still getting more than 100 Mbps. If you’re clever and place your Wifi points within sight of each other, you can have fast internet everywhere in your home. And, that’s basically the crux of what the Google Wifi provides: unrivaled reliability. But life doesn’t simply revolve around download speeds, especially in households with multiple people. The best routers need to be able to handle the heavy load from multiple devices at the same time. The Google Wifi kills it here as well. During our testing, we had two people streaming Netflix in 4K, while a roommate played online games in another room uninterrupted. Google Wifi doesn’t support MU-MIMO, (or Multi-user, multiple input, multiple output,) but due to the nature of the mesh network, it almost doesn’t matter. Unless you’re doing heavy networking over a wireless connection, Google Wifi is going to be more than fast enough for everyday workloads. Which is all we can ask for in a router marketed to the average user. Google Wifi starts at $129 for a single Wifi point, which is perfect for most apartments. If you have a larger home, and you need the added coverage, you’re looking at $299. That might sound like a lot of money, especially if you’ve been using the router built into your cable modem for a while, but trust us, it’s worth the cash. Compared to most other mesh routers, Google Wifi provides tons of performance and more individual nodes. This means that you can cover a greater area for less. And, with a performance this good, we can’t complain. Compared to most other mesh routers, Google Wifi provides tons of performance and more individual nodes. The Google Wifi doesn’t exist in a vacuum, and the Netgear Orbi may be the closest to claiming Google’s crown over the mesh Wi-Fi kingdom. The Netgear Orbi comes with one router and one satellite, as opposed to the Google Wifi’s three nodes, and will set you back about $320. Don’t be fooled into thinking that Netgear is criminally overcharging here though—these two units can theoretically provide more coverage: 5,000 feet, as opposed to the Google Wifi’s 4,500 feet. Google’s setup and maintenance are easier to get into, but experienced network admins will prefer the greater control that Netgear affords them. Overall, it all boils down to budget and accessibility—the Google Wifi is easier to use and to afford, but the Netgear Orbi is more powerful. See our other reviews of the best wireless routers. An excellent router for almost everyone. The Google Wifi might just be one of the best wireless routers on the market, and it’s hard to think of someone we wouldn’t recommend it to. It’s easy to set up, has stellar performance and reliability, and it looks good to boot. It’s not quite as versatile as some other routers out there, but most users will likely see that as a feature. If you don’t want to fiddle around with an obtuse settings menu, and want something that you can just plug in and be ready to browse, you really can’t go wrong with the Google Wifi. Product Dimensions 4.17 x 4.17 x 2.7 in.